A few days ago, the people over @Tastespotting twittered the question: "so... how many of you have a stand mixer?" Upon seeing that, I literally laughed out loud. One stand mixer?? ?, I thought, that's laughable! ludicrous! Because, folks, I have TWO. Yes, that's right, people. Count them: one-two- TWO! One's a dainty four and a half quart-er that R gave me for our second dating anniversary (and, after six years, it still ranks as one of the best anni presents ever). The other's a powerhouse six quart-er that we affectionately call "Bessie the Beast," which I have on extended borrow/loan/keep from my parents who bought her and used her all of... twice? No, I don't live in a bakery, thought sometimes it sure seems like it, and yes, I'm quite proud of the fact that I'm probably one of the only graduate students out there with two stand mixers lying about. But, the awesomeness of living in our little household here doesn't stop there. No, no. The craziness goes on. At last count, I cataloged about forty cake pans that I own, and that was two years ago. I have a feeling that I'm pushing upwards of fifty by now. What? Don't judge me! People, for some unknown reason, enjoy gifting me with baking pans and cake molds, so it isn't all just me. Oh, and by "cake pans," I don't mean tart molds. Those have a whole 'nother count of their own, and if you let me include my mini tartelette molds individually (because, they aren't connected! ), that puts me at well over fifty already. Okay, but really--you ask, where is all of this rambling going? Here's the point: not only do we live in a house with two stand mixers, over forty cake pans, and one lone spinning frying pan, but we also live in a house with two ice cream machines. Yes. This is why we are awesome. Two ice cream machines means that I can make two flavors at once, without having to wait 24 hours between each batch for the ice cream bowl to freeze properly again. 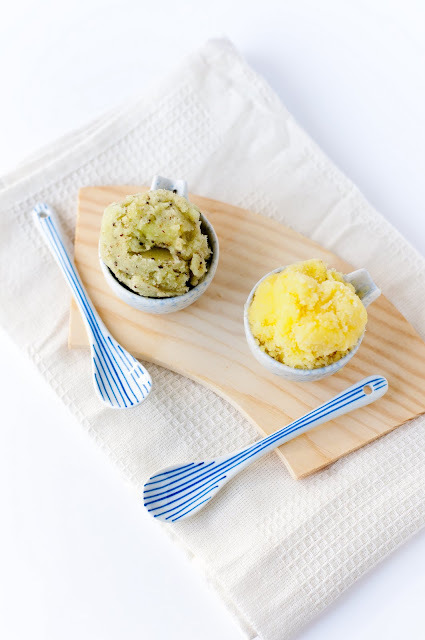 Two ice cream machines means that, within the space of less than an hour, I can whip out two yum-licious and refreshing flavors of sorbets--kiwi and pineapple--for a tropical party in your mouth. Before you call me crazy (if you haven't already), I want to defend myself and say that both of these ice cream machines were wonderful gifts from wonderful people--no, I did not go out and buy two ice cream makers. But anyways, back to the sorbets. Sorbet-making, it turns out, is a great way to use up vast amounts of fruit that you might happen to have floating around. 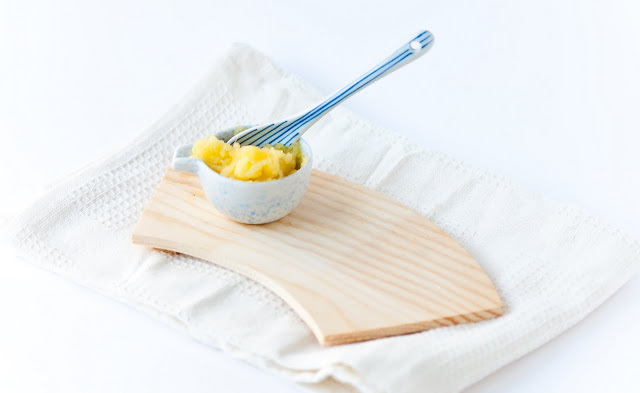 I had a whole batch of pineapple puree left over from making pina colada cupcakes, so I added some water and a dash of rum, and voila!--an amazing, fresh, and icy-almost-wannabe-granita pineapple sorbet. 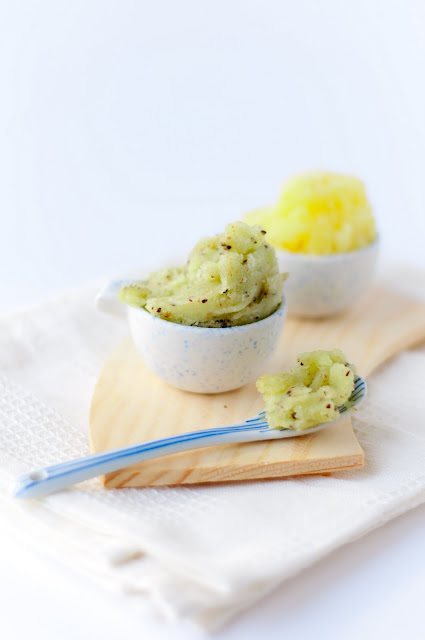 As for the kiwi sorbet, I added a dash of Grand Marnier--not enough to really taste but just enough to enhance the tart sweetness of the kiwifruit. The kiwi sorbet also turned out awesomely. The smooth texture is almost exactly like a raw kiwi, studded by crisp little seeds. 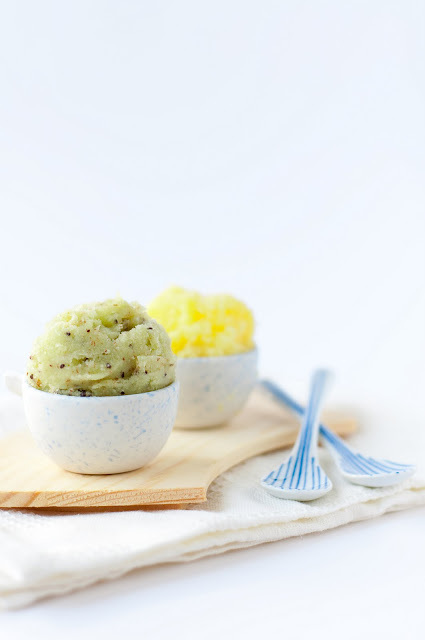 For an extra kick, I snuck a bit of finely grated chocolate into the kiwi sorbet at the very end, just to make it ever-so-slightly richer and creamier. It was like eating summer in the middle of winter! Anyways, have a wonderful first week of March, everyone! Spring is coming so soon! 1. In a saucepan over medium heat, cook the sugar and 1 cup of water without stirring until the mixture comes to a boil. 2. Add the pineapple to the boiling sugar water and return to a complete rolling boil, without stirring. 3. Remove from the heat and cover the pot with a lid. Let cool overnight. 4. Once cooled, drain the liquid from the pineapple. Save the syrup for other uses, like homemade pineapple soda (just add fizzy water!). 5. Put the pineapple in a food processor and process until completely pureed with no chunks. 6. Add the additional 1 cup of water and rum and blend until smooth. 7. Chill the mixture thoroughly, and freeze according to your ice cream maker's directions. 1. Place the kiwi into a food processor and process until puree-ed. 2. Add the sugar, water, and liquors and blend until smooth. 3. Chill the kiwi mixture thoroughly, and freeze according to your ice cream maker's directions. 4. In the final few minutes of the freezing process, add the grated chocolate, if desired, for extra flavor. *Dave Lebovitz makes this big to-do about kiwifruit vs. kiwi terminology, but, frankly, my dialect of English makes no such distinction, and, as a linguist, I see no problem with lexical ambiguity, so kiwi means both the fruit and the New Zealand bird to me. (And the people from New Zealand--I call New Zealanders.) Sorry, New Zealand! Found you through Kristen at Dine and Dish. 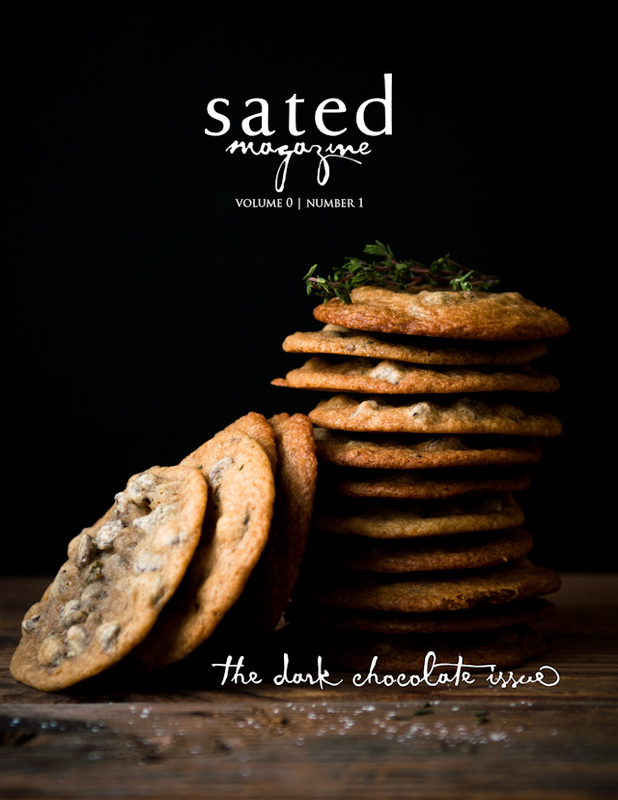 LOVE your recipes and your photos are gorgeous! So jealous! (also totally jealous that you have TWO stand mixers...I'm still pining away for just one!!) Adding you to Google Reader now! I really need two stand mixers...I have one and borrow my mom's when I have big cake orders. Hmmm...I also think I need two ice cream makers! Found you through Dine and Dish. Blog looks great - you have a new follower! 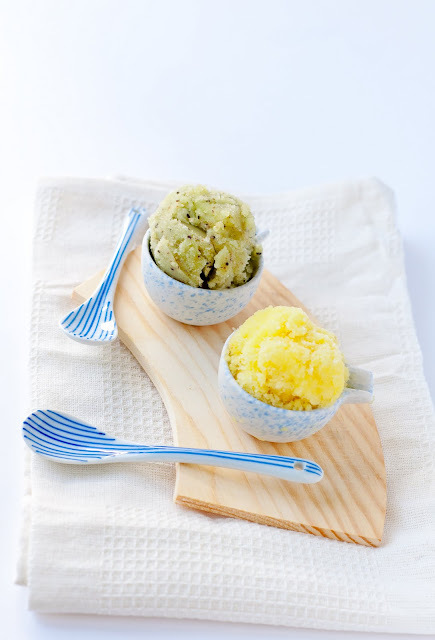 Your sorbets look amazing. I love your photography. I'm going to have to try out the pineapple sorbet recipe. I've been craving a tropical treat. @Katie: yes, two ice cream makers: I would highly recommend it! You study linguistics, too?!!! Wow! Cool! What language? What university? How far along are you in the program? I'll let you know how the sorbet turned out. I just made chocolate chip dough ice cream today, so I won't need to make another batch of the cold stuff for awhile. @Memoria: I'm at Stanford in my third year studying phonology. Where are you? Mmm... chocolate chip dough ice cream. Sounds scrumptious! I don't have two ice-cream makers but I do have two freezing bowls. One bowl just doesn't make enough for my large family and waiting around hours for the bowl to chill before making another batch just wasn't an option. 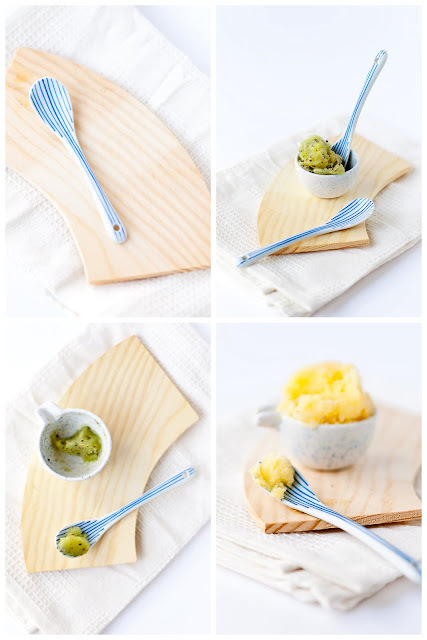 What a great sorbet combo and gorgeous pictures. @WizzyTheStick: having two bowls is smart! S- I'm at the University of Texas at Austin studying sociolinguistics, specifically Brazilian Portuguese grammaticalization and sociolinguistic variation. 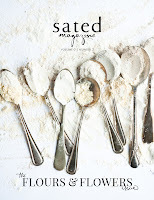 BTW, I made the ice cream and blogged about it!